Richard II was born today, January 6, in 1367. 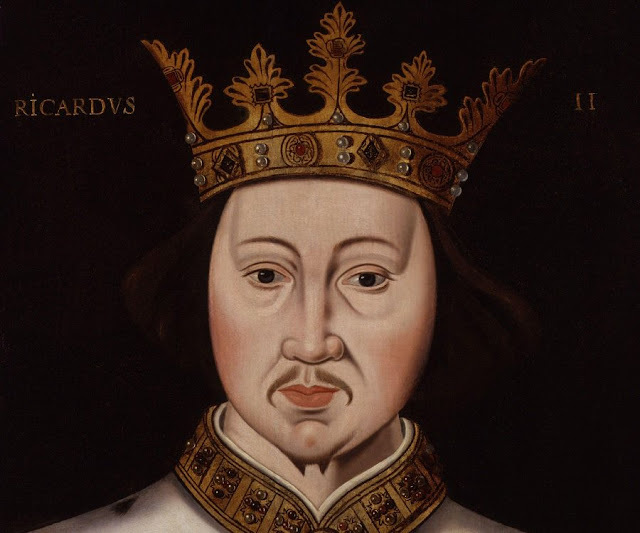 Also known as Richard of Bordeaux, he was King of England from 1377 until he was deposed on September 30, 1399. Richard, a son of Edward, the Black Prince, was born in Bordeaux during the reign of his grandfather, Edward III. His father was Prince of Aquitaine. Richard was the younger brother of Edward of Angoulême, upon whose death Richard, at 3 years of age, became second in line to the throne after his father. Upon the death of Richard's father prior to the death of Edward III, Richard, by primogeniture, became the heir apparent to the throne. With Edward III's death the following year, Richard succeeded to the throne at the age of 10. During Richard's first years as king, government was in the hands of a series of councils. Most of the aristocracy preferred this to a regency led by the king's uncle, John of Gaunt, yet Gaunt remained highly influential. At the onset of Richard's accession, and then for much of his reign, England faced various problems, which included the ongoing war against France (which was not going well for the English), border conflicts with Scotland, and economic difficulties related to the Black Death. A major challenge of the reign was the Peasants' Revolt in 1381, and the young king played a major part in the successful suppression of this crisis. In the following years, however, the king's dependence on a small number of courtiers caused discontent among the influential, and in 1387 control of government was taken over by a group of aristocrats known as the Lords Appellant. By 1389 Richard had regained control, and for the next eight years governed in relative harmony with his former opponents. In 1397, Richard took his revenge on the appellants, many of whom were executed or exiled. The next 2 years have been described by historians as Richard's "tyranny." In 1399, after John of Gaunt died, the king disinherited Gaunt's son, Henry of Bolingbroke, who had previously been exiled. Henry invaded England in June 1399 with a small force that quickly grew in numbers. Although he initially claimed that his goal was only to reclaim his patrimony, it soon became clear that Henry intended to claim the throne for himself. Meeting little resistance, Bolingbroke deposed Richard and had himself crowned as King Henry IV. Richard died in captivity in February 1400; he is thought to have been starved to death, although questions remain regarding his final fate. Richard was said to have been tall, good-looking and intelligent. Less warlike than either his father or grandfather, he sought to bring an end to the Hundred Years' War that Edward III had started. He was a firm believer in the royal prerogative, which led him to restrain the power of the aristocracy, and to rely on a private retinue for military protection instead; in contrast to the fraternal, martial court of his grandfather, he cultivated a refined atmosphere at his court, in which the king was an elevated figure, with art and culture at its center. Richard's posthumous reputation has been shaped to a large extent by William Shakespeare, whose play Richard II portrayed Richard's misrule and his deposition by Bolingbroke as responsible for the 15th-century Wars of the Roses. Modern historians do not accept this interpretation, while not exonerating Richard from responsibility for his own deposition. While probably not insane, as historians of the 19th and 20th centuries believed, he may have had what psychologists today identify as a personality disorder, particularly manifesting itself toward the end of his reign. Most authorities agree that, even though his policies were not unprecedented or entirely unrealistic, the way in which he carried them out was unacceptable to the political establishment, and this led to his downfall. One of his first significant acts was to marry Anne of Bohemia. The marriage had diplomatic significance; in the division of Europe caused by the Western Schism, Bohemia and the Empire were seen as potential allies against France in the ongoing Hundred Years' War. Nonetheless, the marriage was not popular in England. Despite great sums of money awarded to the Empire, the political alliance never resulted in any military victories. Furthermore, the marriage was childless. Anne died from plague in 1394, greatly mourned by her husband. Michael de la Pole had been instrumental in the marriage negotiations; he had the king's confidence and gradually became more involved at court and in government as Richard came of age. De la Pole came from an upstart merchant family. When Richard made him chancellor in 1383, and created him Earl of Suffolk 2 years later, this antagonized the more established nobility. Another member of the close circle around the king was Robert de Vere, Earl of Oxford, who in this period emerged as the king's favorite. Richard's close friendship to de Vere was also disagreeable to the political establishment. This displeasure was exacerbated by the earl's elevation to the new title of Duke of Ireland in 1386. The chronicler Thomas Walsingham suggested the relationship between the king and de Vere was of a homosexual nature, due to a resentment Walsingham had toward the king. I especially love all the Shakespeare history plays, moreso than the tragedies or the 'comedies' as a respective 'body of works'. Among the histories I always get a sense of excitement when it comes round to the turn of re-reading Rich II again, truly one of the 'jewels in the crown', as it were. Please everyone, do NOT click on above link from Anon. It'll be a ruse to bug-invade your computer. TGA, are you able to delete it, please? Thanks Raybeard! Anon comment deleted.